This page contains a list of Taranaki District Health Board documents, sorted alphabetically. If you are experiencing difficulties then please contact us for a paper copy. Our short term plan and shows what the Taranaki DHB is going to do over the next one to three years. 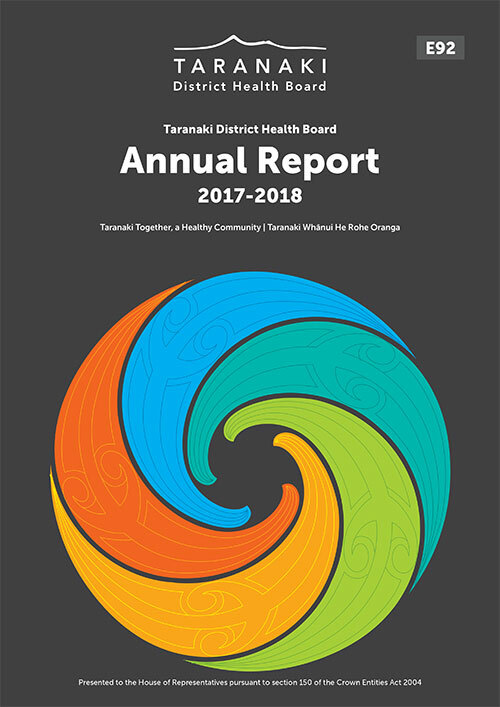 The Taranaki DHB Annual Report reports on progress of the Annual Plan on a yearly basis. 'Health News’ gives an account of how the DHB has been supporting and improving service provision and quality of patient care. Taranaki DHB Healthy Food and Beverage Environments Policy. - acknowledges the needs of different cultures, religious groups and those with special dietary needs, and will accommodate these on request, where possible and practicable. These Guidelines (PDF 1 MB) have been developed principally for personnel who are asked to intervene in cases of hoarding leading to severe domestic squalor. The Guidelines are designed to assist front line workers of various government and non-government organisations (NGOs) to constructively intervene and improve the situation of people who are living in severe domestic squalor. Improving the efficiency, speed of action and coordination of work between relevant agencies, has the potential to improve the health and quality of life for individuals who have been living in severe domestic squalor. These plans document the direction for funding, planning and delivery of services in Taranaki over the next twelve months. Its primary focus is to improve Māori health status and reduce Māori health inequalities. Te Kawau Mārō - Taranaki Māori Health Strategy 2009 to 2029. A vision for the future of health services in the Midland Region to provide a framework for the five Midland DHBs to continue to plan and work cooperatively. This Annual Plan outlines the range of services the PHU will deliver each year. This five year plan outlines the vision, goals, priorities and strategic approach that will guide the work of our Public Health Unit over the next five years and will lead to changes in the way the team works in future. In particular the PHU aims to work smarter and more strategically with key stakeholders, identifying opportunities for working in partnership on shared population health outcomes. The Statement of Intent (SOI) has a three year focus and is the formal accountability document between the health board and parliament. 1. Provide a snapshot of progress in addressing many of the determinants of health including child poverty and living standards, housing, early childhood education, oral health, tobacco use, alcohol related harm, and children’s exposure to family violence. In 2012 Taranaki DHB in partnership with various organisations and agencies led the development of the Taranaki Taiohi Health Strategy. The aim of the Strategy is simple, young people are an important resource for the future. We consulted a range of young people and professional groups to help guide us in prioritising what we need to do. As agencies and organisations who work with young people we see our role as encouraging and supporting Taranaki taiohi to achieve their optimal health and well-being. The Strategies and Supporting document describes how we propose to do things differently guided by principles and values to ensure we are able to make a difference. - A Taiohi version of the Strategy (PDF 797 KB) which summaries what we want to achieve for young people based on what they have told us.